* This book is a brief introduction to publishing through Kindle Direct Publishing (formerlyCreatespace). People who are thinking about self-publishing for the first time will find it helpful. It gives easy to understand, step-by-step instructions and tips. * Thanks, Geoff! This has (literally) changed our life, because it has opened up new avenues of sharing the gospel and the Word. Blessings! 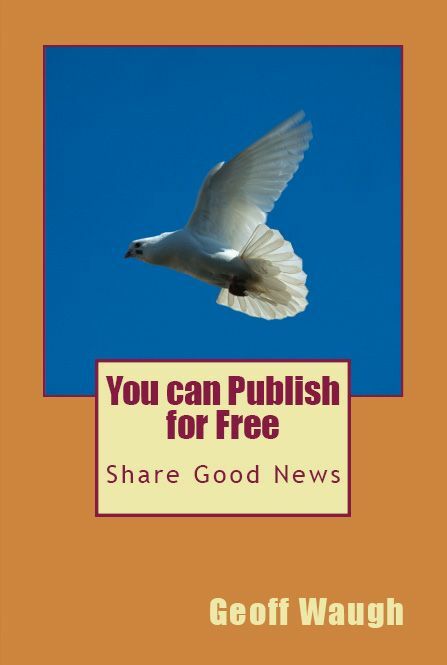 You Can Publish for Free is a small book you can use or pass on to others, showing you how you can publish for free and share your good news. This morning I had an idea: Why not make a book explaining how to make a book for free? I’ve been publishing books for a while. It used to cost me a lot, but now I do it for free. So can you. All the guidebooks and articles that I found seemed hard to understand, so I thought: Why not make a simple guidebook that anyone can use? Here it is. This book is available to order in print or immediately available on Kindle. I uploaded it to CreateSpace publishers for free. All you need is a computer (or laptop, or tablet, or even a smartphone) linked to the internet. The Kindle version is handy because it has direct links to web pages. I chose to print this book in ‘color’. That costs a bit more but for small books of 24-40 pages or so, copies are not expensive. If you use images or photographs they look better in ‘color’. So if you would like to publish a book like this simple one for free, go ahead. It’s easy to do. You can upload it today for free and order copies tomorrow! You just pay for the copies you order, from one to any number you want. And authors/publishers get their copies cheaper than anyone else! An easy way to start would be by using your family or holiday photos. Many people have albums on web pages such as on Facebook but books are still popular and welcome, especially as gifts. You may like to use images as I have done in my Appendix. An older grandson wrote a biography for a primary school assignment so I published that and it became a welcome and popular gift. He did the layout himself. You could help your children or grandchildren make a small book of around 24 pages. Your children or grandchildren may appreciate your autobiography or part of your life story. The world has changed so much since the twentieth century that your story could be really interesting especially if you illustrate it with some photos. You could start with some small books and then combine them into one larger volume later. I have published various essays written by my students and made them available in a book. If you do that you become the editor of that book. Students often gave their work to me with better formatting than I can do myself. I have encouraged students to publish their work, for free. Maybe you lead or speak in a study group and could gather your material into a small resource book. You can have that published and in your hands within a month, or have it available on Kindle tomorrow! I often use my books as resources for my speaking or teaching. Why not try something to begin? You may find yourself enjoying this hobby and helping or blessing others in the process. A huge advantage of Kindle Direct Publishing is that you can upload new editions, or corrections, also for free. Digital eBooks are easiest to do now. Just upload your Word file to Kindle! Add a free cover you create with Cover Creator. Just go to Kindle Direct Publishing (an Amazon company) and follow the links. What you publish there goes on Amazon and Kindle for free. Expanded distribution adds your book(s) to The Book Depository with free airmail worldwide, and your books are listed on other distributors, some of which get listed on Amazon as well. You can start small. For example, King of the Granny Flat (a biography – Look inside) was a Grade 7, primary school assignment done by my grandson, Dante Waugh, including the layout and photo selections. So Grandpa just published it – for free. There’s an idea for parents and grandparents! The main disadvantage is that all your errors get published (in print or digitally) just as you upload them! But it’s easy to then upload a corrected version for free. If you have a spouse or friend good at editing, you’re home and hosed. Kindle Direct Publishing now provides a brilliant digital proof of your book that you can examine before publishing. Build your free Revival Cloud library then download a book anytime. Manage your Content and Devices / Settings / Automatic Book Update. Share this on Facebook, Twitter, Google & Linkedin on the links below. Share with others – Blessed to bless.